Liam Perrin is no stranger to storytelling. He worked for half a decade on the legendary Myst video game series. After 3.7 million votes were cast in 175 countries, the Smithsonian American Art Museum selected Myst to be one of 5 featured games out of 240 in the standing Art of Video Games exhibition. Liam worked on the series in various roles including technical art, technical game design, and finally as the Live Content Director on the beloved Myst Online (formerly Uru: Ages Beyond Myst). Sir Thomas the Hesitant and the Table of Less Valued Knights is Liam's debut novel. 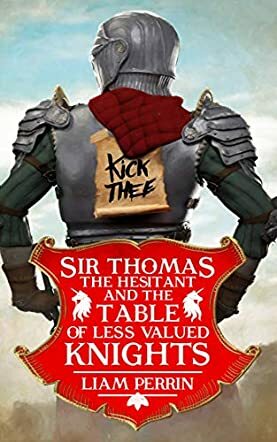 "Sir Thomas the Hesitant and the Table of Less Valued Knights" is a very creative take again on Knights of the Round Table. There are so many stories that can be written on any number of topics where the story of Camelot is concerned. It just needs someone who sees it clearly. Liam Perrin seems to have that ability with the Knights. He realizes all knights cannot begin as the most noble of knights and therefore must be taught and learn from the ground up. Molding a Knight must come from somewhere. Therefore, Arthur gives those from the surrounding communities a chance to ask for the privilege to do so. This is where Thomas comes in and the Knights are considered lesser valued because they really do not have skills . . . or at least none developed yet that can be of any use. Developing one’s own way in the world can at times be more daunting than you expect, which is the case of this LVK (Less Valued Knight), Thomas. William is Thomas’s older brother, who was falsely imprisoned while trying to act on behalf of those in the village who are starving. Thomas starts out to learn a way to rescue his brother when other LVKs, as well as other people who are considered less valued in the eyes of the existing Baron of their community, come to his rescue. You never know where nobility might come from when all one needs are his friends to rally for the occasion. Enter LVK, people from the community, immediate family and your less valued friends. Sometimes it isn't the best of the best who “wins the day”. It is those considered of a “lesser value”. Well-written and a fun adventure.